After finding himself in a coffin, on the way to Boot Hill, Clay Tulane wants answers. As he pieces together the story of how he got there with the help of local townsfolk Miss Winona and the boy Pocket, he finds himself drawn into a violent struggle against local landowner, Marsden Rockwell, and his bunch of hired guns. Tulane has more personal reasons, however, for seeking a final confrontation with the notorious killer, Lonnie Spade. As tension mounts and battle lines are drawn, Tulane’s search for the truth throws up as many questions as answers. What is the real reason Rockwell and his Bar Nothing outfit want to take over the neighbouring Pitchfork L, and is it connected with the mystery of the strange mesa known as Sawn-Off Mountain? This book starts with a tense and claustrophobic scene that sees Tulane waking in a coffin. His sense of panic and frantic attempt to escape comes over extremely well. Once free, Tulane finds himself with many questions that want answering and it’s these that see him getting involved in a land-grab war. Colin Bainbridge writes in a very easy to read style, telling his story in seven chapters. He switches regularly from one group of people to another as most of his main characters find themselves converging on Swan-Off Mountain for different reasons. As the story develops it soon becomes obvious that there will be one mighty showdown as all sides come together and this gunfight is well worth waiting for and it seems no-one if safe from the many bullets that are exchanged. I’ve read a couple of Colin Bainbridge’s other books and enjoyed them and this one proved to be an equally fun read. Second Lieutenant Bret Hollister is charged with finding two women who were taken hostage and bringing those responsible to justice. But when an unfortunate mishap results in the massacre of almost his entire patrol, he’s forced to return to Fort Ellis a failure. Betrayed by the survivors of his unit, Bret is stripped of his rank and resigns from the army in shame. But he hasn’t forgotten about the two women whose lives are at stake. So with the help of old trapper and army scout Nate Coldiron, Bret resolves to go after them on his own – no matter who stands in his way. Charles G. West paints his landscapes with such vivid descriptive prose that you’ll find yourself right there with his heroes, Hollister and Coldiron. You’ll share their despair at finding the two missing women in such as vast land. The hunt is frustrating and slow but eventually the clues to their whereabouts begin to reveal the trail they must follow, and in doing so the two men will become hunted themselves. There is plenty of action scenes within this story but it’s more the study of emotions and how people deal with the feelings of anger, hate, despair, fear, and elation that comes across so well. Witness thoughts of suicide, terror at every shadow, and the joy of hope of a new life that makes this book such a satisfying read. Charles G. West has a large back catalogue and many of these books sit on my shelves and after reading this one I’ve realised that I’ve read far too few of them and must rectify this as soon as possible. When the town’s newspaper office is burnt to the ground and the owner murdered, suspicion falls on the young deputy marshal of Progress, Lane Cutler. His alibi – that he was being held prisoner and tortured at the time of the killing – persuades veteran lawman Ben McCabe to go in search of the truth. The marshal runs into a wall of silence, propped up by blackmail and revenge, and when there are more killings, McCabe is forced to enlist a friend of Cutler’s, to stand by his side during the final violent showdown. As far as I can tell this is Peter Wilson’s third book about Ben McCabe, and, yes, there is mention of those two previous books’ events, but you don’t have too have read them to enjoy this one. Peter Wilson soon had me hooked with the many questions about the killing and those that surface during the investigation into this death. Wilson lets the reader in on a few of the answers but always leaves more hanging to ensure the reader will keep turning the pages. Halfway through the story there’s a major twist that came to me as a complete surprise, this in turn leads to more murders. McCabe’s hunt for the killer sees him uncover lots of dark secrets that have him looking at people he thought he knew in a new light. Trouble is he may have his suspicions but proof is extremely difficult to come by. Even when I thought I’d figured out the direction the story would take, Peter Wilson threw another curve ball into the plot-line making it impossible to predict where this excellent tale would go next. After the final shots have been fired and when everything seems to be neatly tied-up, Peter Wilson has one more twist waiting that brings the story to a neat end that left me with a grin on my face and looking forward to his next book. 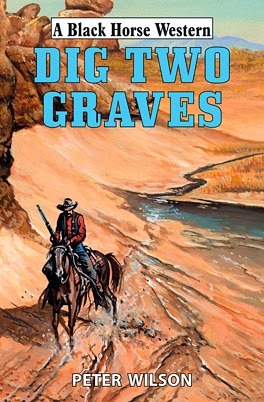 Dig Two Graves has an official release date of March 31st but is available now from the usual Internet book sellers. Wyoming 1861 – where a young killer has gone on a spree and has Fargo in his gun sights. After Skye Fargo is tossed in the pokey for brawling in the town of Horse Creek, the last thing he expects is the marshal asking for his help. The notorious Cotton gang – led by a fifteen-year-old terror – has robbed the bank, and they have to be stopped. But the Trailsman doesn’t know that the young killer has a very special reason for riding wild – revenge. The author writing behind the pseudonym of Jon Sharpe this time is David Robbins, and as expected he’s written a book packed full of savage action, cracking dialogue and a plot that twists and turns as well as offering a couple of surprises that I didn’t see coming. For those who like strong characters of both sexes then you’ll find them here too. Marshal Coltraine, who Fargo wants to trust. Amanda Brenner, a young woman with a fast mouth and a secret. Hoby Cotton, the young killer who maybe more than a match for the Trailsman and leaves Fargo in a very sticky situation that’ll had me wondering how he’d escape in one piece. 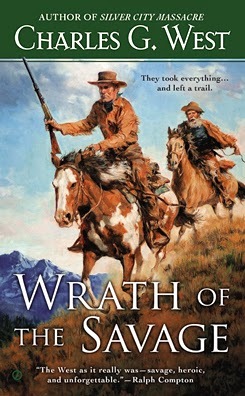 The story races along at a frantic pace and is told in short chapters that usually end on a cliff-hanger making this a very hard book to put down until the end is reached and sees Fargo questioning the motives behind Hoby’s vengeance trail, before everything is neatly wrapped up in a fast exchange of gunfire. 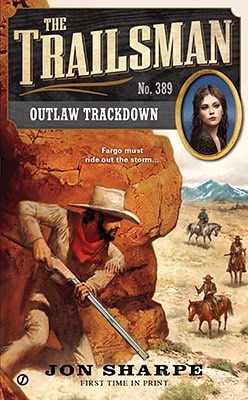 Outlaw Trackdown is an excellent entry into this long-running series and has me wanting to read more immediately. Unlike his brothers Jacob, Sam and Patrick, Shawn O’Brien isn’t content to settle down on the family ranch in New Mexico territory. With his razor-sharp eye, lightning-fast draw, and burning thirst for justice, Shawn is carving out a reputation of his own. As a town tamer he takes the most dangerous, lawless towns in the West and makes them safe for decent men, women, and children. 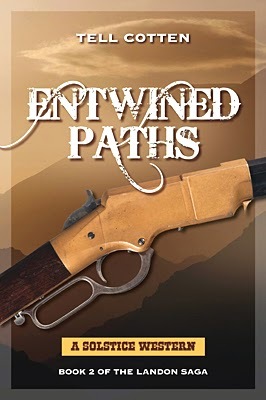 When a stagecoach accident leaves Shawn stranded in Holy Rood, Utah, it doesn’t take long to realize he’s landed in one ornery circle of hell. Ruled by a cruel and cunning crook-turned-merciless dictator named Hank Cobb, Holy Rood is about as unholy place as any on the frontier. Anyone who breaks Cobb’s rules is severely punished. Anyone who defies Cobb’s hooded henchmen dies by rope, stake, or guillotine. 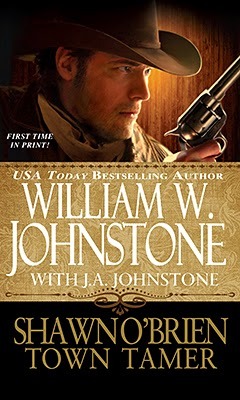 This is the first book in another new series from the Johnstone’s. Shawn O’Brien, Town Tamer is a spin-off from the series The Brothers O’Brien. The stagecoach ride into Holy Rood along a road lined with human skulls sets the mood of this book perfectly. The destruction of the coach sees its occupants thrust into a living hell that painted all sorts of vivid images within my mind. Cobb’s plays on peoples’ fears of witches, and the wrath of God, to spectacular effect for his own greed. The horrific acts O’Brien witnesses and learns about fuel his resolve to destroy the hold Cobb has over the citizens of Holy Rood and this all means this book is packed full of exciting action which also reveal some strange goings on too, such as how can a dead man be living again? The author switches between characters often. As well as some excellent male roles there are some terrific female leads too, such as Sally, a girl O’Brien saves from being burned at the stake. Of the male characters I would single out Mink Morrow, a going blind gunfighter, as one of the best. A man who you’re never quite sure whose side he’s going to support, if any. At the beginning of this book O’Brien isn’t a town tamer but it’s after the violent acts in Holy Rood that he decides this is something he could be good at and this sets up the theme for the coming books in the series, books that I fully intend on reading. Texas, 1872. When a stagecoach is robbed, two men are killed and a young woman is kidnapped. Soon after, Yancy and Cooper Landon find themselves pursuing them. Meanwhile, their old foe Lee Mattingly has his own problems. Betrayed by his partners, Lee sets out on a path of vengeance while at the same time trying to help a young captive girl. It isn’t until their trails cross that both sides realize just how entwined their paths are. And, they soon realize that if they are to achieve their goals, they will have to go down the same path together. This is the second book in the Landon saga and enough information is included to make this a very enjoyable story without having to read the previous book first, although I’m sure once you’ve read this one you’ll be certain to grab a copy of that earlier tale if you haven’t already read it. Tell Cotten has created an engaging set of characters, be they on the right side of the law or not. Their personalities come across well and I was soon hoping that most would survive so I could read further stories about them. Of course not all will be alive to ride again but I can’t reveal here who dies as that would spoil it for anyone considering reading this book. Cotten tells his tale in very short chapters, switching from one set of characters to another chapter by chapter, often leaving them in perilous situations or with a question that needs answering. This ensures the reader will keep turning the pages and thus makes this a very hard book to put down. Full of action, tough talk, humorous moments, mistrusts and double-crosses this book proves to be a very entertaining read indeed that has left me eager to read the third book in the series when it is published in the not too distant future. When Appaloosa King is asked by Judge Nathan Berkley to ride to the remote town of Deadlock, the task is seemingly simple: pick up his daughter. Yet on the way trouble arises when the cowboys take a diversion to meet up with a mysterious messenger. But the messenger has another motive for wanting to meet King, and it’s a deadly one. All looks lost until a stranger arrives on the scene who goes by the name of Skyhorse. As far as I can tell this is the second Black Horse Western about Appaloosa King but I don’t believe you need to read that earlier book first to fully enjoy Skyhorse. Revenge is the theme behind this one that may have its origins in the previous book but there is enough of the backstory to this plotline to understand why King becomes the target of three killers. Skyhorse makes for an interesting character from Indian legend, but here he’s very real and we, the readers, find out a little about who he really is – not that he’s sure himself. Confused? That’s all part of the intrigue of this story. King riding to collect Nathan Berkley’s daughter is the opportunity the killers need to set their trap into which their victim all too readily rides. It’s this storyline that takes up most of the book and leads to some exciting, violent, action. Fear is also portrayed well when one of the killers sees Skyhorse and remembers the deadly tales of what befalls those who lay eyes on the mysterious rider. John Ladd is a pseudonym used by the prolific author Michael D. George who writes westerns for Hale under a variety of different names. This book re-enforces why he has such a large following and if you haven’t tried his work yet then this could be the perfect place to start. 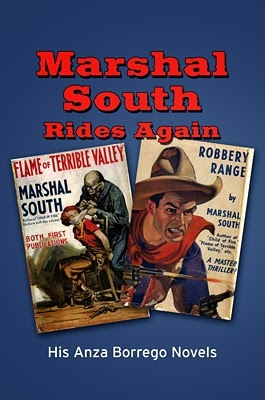 In Flame of Terrible Valley, Jim Brandon’s encounter with Flame Truman at the ghostly ruins of the Vallecito Stage Station finds him suddenly caught between the dogged vengeance of a Chinese Tong, the quest for stolen gold, and the desire to save this woman from her heartless father and the relentless Tong. In Robbery Range, a puzzling poem recovered from the papers of a dead stagecoach robber becomes the key to the hidden treasure sought by both the robber’s grandson and the great granddaughter of the stagecoach passenger who had been robbed and killed by the outlaw. Marie Banniston is in grave danger as she is pursued by the Hesfor gang. Can Rodney Kent save her from these ruffians and win her heart? This beautifully put together book starts with a foreword written by Diana Lindsay which delves into Marshal South’s life; his time living in the desert with his family; and, of course, his writing history. The book also contains many black and white reproductions of Marshal South’s photographs, paintings, and includes some of his poetry (he was considered being named poet laureate of the United States), and this all makes for a fascinating background to the two stories which were both originally published in England, the first in 1935 and the other in 1943. Marshal South is a terrific storyteller; his books filled with tense situations, intriguing mystery and prose that’ll keep you turning the pages. These two stories are filled with Western action not to be missed. It seems such a shame that Marshal’s South writings have been overlooked for decades, but with this Sunbelt publication that oversight has begun to be rectified. Both stories stand the test of time, and yes they contain some dialogue and views of the pulp days but this adds to the charm of these excellent tales. 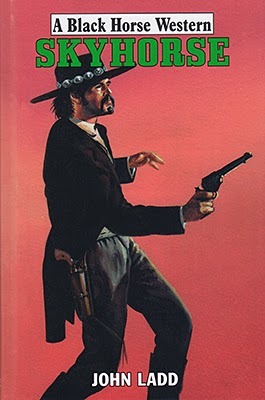 This definitely is a not-to-be-missed book of western entertainment for all those with a love of the genre. 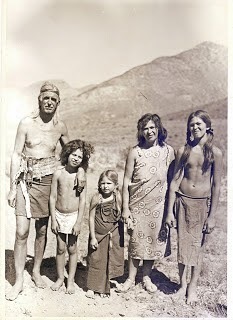 The South family at Yaquitepec, 1946. 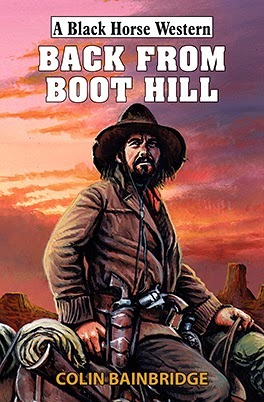 For years and years I've been a reader - and collector - of western fiction, mainly from series. Sometime ago I was persuaded to write reviews and these are now appearing here. Along with these reviews you'll also find interviews with authors and cover artists. New JASON BRAND released today! The Gunslingers Grave: A Blood Moon Rises! Werewolves in the Old West! Interesting Pulp Items for Sale at Murania Press.